When you need vinyl flooring, trust our experienced and friendly staff to help you choose the best possible match for your home’s décor. Our company has years of expertise in designing, selling, and installing vinyl floors for our customers, so let us help you with all of your vinyl floor needs. From designing custom floors for your kitchen to handling vinyl flooring installation in the bathrooms, we take care of your new flooring needs every step of the way. One visit to our spacious flooring showroom is all it will take for you to realize we are your most affordable and reliable local source of vinyl tile flooring options. From designing custom floors for your kitchen to installing vinyl tile for the bathrooms in your home, we are sure to find the ideal flooring to suit your style, budget, and performance needs. You can choose from a wide range of vinyl floors for any room in your home or place of business when you come to our flooring store. We have examples for you to peruse, and we can answer any of the questions you might have about choosing vinyl floors for your property. The choices we offer for flooring upgrades are limitless! We know that picking the right floor can be a daunting task, especially when you aren’t focused on a single design idea. Let our knowledgeable and friendly staff narrow down the choices for you. Take advantage of the personalized attention we give our customers, and you’ll soon be making an easy and efficient addition to your property. Some of the most popular types of vinyl flooring include sheet vinyl, vinyl plank, and vinyl tile. 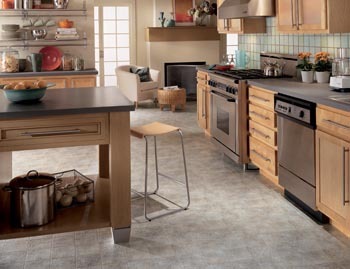 Vinyl tile flooring is an ideal choice for any room that could use a touch of elegance or traditional style. Vinyl plank resembles hardwood but has the price tag and maintenance needs of vinyl. With such a huge range of vinyl flooring options to choose from, we’re sure to have something to suit your needs precisely. Looking for Vinyl Flooring Installation Services? Once you’ve chosen the perfect vinyl flooring for your home remodeling project or upgrade, allow our vinyl flooring installation specialists to install it. An important part of ensuring your floors last as long as possible is proper installation by professionals, so let our experienced team install your new floors using the right equipment and process. Leave the heavy lifting to us when you make an appointment with the installation experts at our flooring store. Our installers are known for their effective and efficient process. Our experienced installation staff has the state-of-the-art equipment and tools to ensure you get the exact results you expect. Take advantage of our Lifetime Installation Guarantee when you sign us up for your installation. This warranty protects any floors installed by our experts. If you experience any installation-related issues with our floors at any time, we’ll fix the problem at our expense for the lifetime of your floors. Make the most out of your flooring, and improve the appearance and value of your home. From traditional white and beige to bold blue and red vinyl floors, we offer the right flooring to upgrade any home. Let us help you enhance the beauty of your home with our stylish and durable vinyl floors. We carry outstanding floors by industry-favorite manufacturers like Naturcor, Downs, PURStone, and Spotlight Values. No matter what style or brand of vinyl floor you’re looking for, we’re here to help you find it. When you decide to purchase your new floors from us, you g4et our Confidence Plus Warranty, which allows you to replace your 4- or 5-Star Rated floor within 30 days of installation, free of charge if you aren’t completely satisfied. We’ll even pay for the labor. Our Price Protection Guarantee means that if you find the same style of flooring by the same manufacturer at a lower price within 30 days, we’ll refund you the difference. Contact us today when you want more information about our vinyl flooring options. We install quality vinyl floors in homes throughout Medina, Brunswick, Strongsville, Kinckley, and North Royalton, Ohio.